Editor's Note: Jake Biddington reports in this May 2010 installment of The Bentley. Anyone who visits Buenos Aires and experiences only a malbec and a superb steak hasn't been applying himself. In this sophisticated city, the cuisines available are many and varied. For foreigners, the pleasure-to-value ratio remains extraordinarily favorable despite the turmoil in international currencies. Agriculture looms large in the Argentine economy. Its farm-grown riches bring to mind rural France or America's breadbasket. In the markets and on the menus, quality meats, fish, grains, fruits, produce and herbs abound. If you're starved for a vine-ripened tomato or a delicate white peach, travel to Argentina in January. 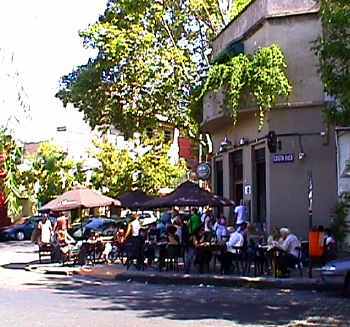 La Cava Jufré--This delightful corner wine wine bar is located across Avenue Córdoba from Palermo Soho in the neighborhood the locals know as Villa Crespo--and the realtors call "Palermo Queens". La Cava Jufre's affable owner knows his wines and likes to educate and please his customers. His very large selection includes wineries that hardly ever appear on standard restaurant wine lists. So, if you ask for a young medium-weight red or a fine older vintage malbec, he will pick two or three options and describe their merits so that you can make an informed choice. To accompany the wines, light food dishes include (excellent) empandas or a plate of quality cheeses, cold meats and olives. Villa Crespo: 201 Jufre corner of Jufre and Julian Alvarez. Telephone: 4775-7501. La Parrilla de Honduras--With inflation revving up and restauranteurs cutting corners, a reasonably priced newcomer with fine quality beef and interesting wines at fair prices is a real "find". This storefront spot with adjacent side room is perfect for classic, simple Argentine grilled meat and potatoes in an informal setting. Note: their bife de chorizo steak is the best we've enjoyed in 2 or 3 years. Palermo Viejo: Honduras 4500 at Lavalleja. Telephone: 4833-1279. Puerto Cristal--For fine seafood in Puerto Madero, this chic, pricey spot is not to be missed. Consider sharing a seafood salad plate or a beautiful order of thinly sliced octopus, before a main course of wonderful South Atlantic fish and seafood selections. The waterside tables are in the smoking section, but even non-smokers seem content there. Puerto Madero: Alicia Moreau de Justo 1082. Telephone: 4331-3669. At lunch indoors or out, for an inventive mixed salad or a burger with chunky fries, this pleasant corner restaurant can't be beat. At nighttime, Kendra turns more elegant with a good wine selection to complement the Argentine dishes such as Patagonian lamb, pastas and a tasty baked salmon. The proximity to the Viruta Tango makes Kendra a natural stop for a late dinner prior to hitting the milonga scene or for a good glass of wine. A boutique hotel (www.palermosoholoft.com) with just four gorgeous rooms has been recently added on its upper floors. Palermo Soho: Cabrera 4802 (at Armenia). 4773 0968. More than just a parrilla with good beef, this spot offers specialty items such as pacú--a river fish from the Rio de la Plata. High-end wines, (plus the moderately-priced standards), draw an upmarket (but casual) audience. Palermo Soho: Gurruchaga 1406 (at Cabrera). 4831-1961. Well, let's say the more upmarket locals go here. A large and lovely space, this all-day resource serves varied fare from desayuno (breakfast) through dinner. Palermo Soho: Armenia 1676. 4833 6807. Capo--The cosmopolitan background of the well-traveled management is apparent in this elegant pasta restaurant across from the former public laundry in Palermo Soho. When a mixed antipasto includes swordfish-kebobs, it's no surprise that the main course pastas are flavorful and interesting. A short but well-selected wine list offers good choices across a broad price spectrum. Palermo Soho: Gurruchaga 1946. 4833 0768. At dinner, this typically Porteño, brightly lit barn of a parrilla fills with the ubiquitous young families, grannies, businessmen and couples. Palermo Hollywood: Paraguay and Humboldt. Surprising though it may seem, THE brunch destination for Palermo Hollywood is a Scandinavian restaurant housed in an airplane hangar of a space on Gorriti. Phone ahead or be prepared for an hour's wait--a wait totally justified by the preliminary breads alone. The salmon gravlax melts in your mouth--but the herring is a little al dente for my taste. Palermo Hollywood: Gorriti 5870. 4776-7677. In the Armenian/Arabe section of Palermo Soho, this eating barn is jammed nightly with diners enjoying wonderful mid-eastern fare such a kefte (chopped beef) a la parrilla and variations on the ubiquitous eggplant. Presenting tasty, wholesome food, at incredibly reasonable prices, this is a favorite destination for extended families and work groups. Palermo Soho: Malabia between Cabrera and Niceto Vega. Located in Argentina's cold and grassy southern region, Patagonia is the source of trout, game and extraordinary lamb. Like the high desert American Southwest, Patagonia conjures up mystical and romantic connotations. The aptly named Patagonian winery "Fin del Mundo (End of the World) has recently opened a most elegant restaurant with bar on Honduras in Palermo Hollywood just across from Mumbai. Patagonian lamb, trout and other southern Argentine favorites are beautifully presented to a beautiful crowd and accompanied by this ever-improving winery's selections. Try their "Fin" pinot noir. Honduras 5673 between Fiz Roy and Bonpland. With borders stretching from the 24th to the 54th parallels of latitude and from the Atlantic coast to the high Andes, Argentina produces regional cuisines reflecting a diversity of geography and cultures. On the eastern slope of the Andes, the province of Tucuman near northern Chile and Bolivia makes a regional cuisine built around spicy and agridulce meat and vegetable stews called guisos. These one-dish delights include all the food groups. In Tucuman cooking, vegetables including carrots, corn or potatoes and fruits such as peaches serve as ingredients in a sweet carbonada, in a spicy locro stew, or as filling in a savory empanada. 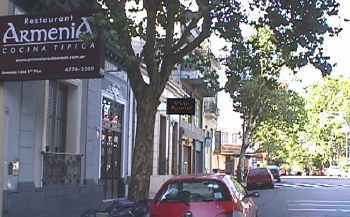 Palermo Soho: Costa Rica 4848. 4833-3599. In a corner building Palermo, this extremely modest storefront venue is home to great authentic Tucuman guisos and plump, vegetable-filled empanadas and empanadotas (double-wide empanadas). Save room for millehojas--a traditional meringue-encrusted torte of crackers and dulce de leche. This dessert is the treat of choice for birthday and other significant celebrations. Take-out and delivery are available. Palermo Soho: Cabrera 5300. 4777 3711. As is typical of regional Argentina restaurants, La Querencia's decor leans toward the woody and spartan with the lighting is a bit too bright, but the guisos and pastel de papas (a veal version of a shepherd's pie) are wholesome and tasty. Though not a part of the regional cuisine, the select-your-own-ingredients salad here is one of those homey, healthy touches that makes it possible to eat out every day in Buenos Aires without sacrificing nutritional standards and balance in the diet. Two locations. Like high-speed Internet, cable TV is ubiquitous in Buenos Aires. For devoted dinners interested in exploring Argentina's cuisine beyond steak al la parrilla, the El Gourmet station (channel 41) offers much information on regional cuisines and wines in Argentina. It's in Spanish, but the content is readily apparent from visuals and recipe information. Online at: www.elgourmet.com. 10 Mil y Pico Bar-- Diagonally across Cabrera Street from Kendra, this new bar with its saavy owner from Madrid brings a much-needed coffee/drinks/hanging/meeting spot to the western end of Armenia Street. Palermo Soho: Corner of Armenia and Cabrera. With its long bar and "living" seating, this cool spot fills a niche for visitors who are having a hard time adjusting to Argentine dining hours that typically start around 10 pm. In Buenos Aires where beautiful women are awash on the streets and where all but the very rich drive clunkers, the real objects of desire are automobiles. In this pizza bar/cafe, the model of choice is the Morris Mini. It's a strange spot, but they mix a nice Bellini. OK. I'll just say it: Should I never make another profitable trade, I could survive happily on empanadas and vino tinto. Of course, as in all things, quality is everything. I find take out empanadas from even the best confiterias or bakeries to be soggy and unappetizing. To date, on what I hope will be an exhaustive empanada tasting, my favorites are served at the mother-ship location of wood oven pizzeria called Romarios (on Cabello in the more bourgeois section of Palermo). Import costs are to blame for the fact that ethnic restaurants in Buenos Aires run more expensive than the ones featuring local cuisine. For satisfying the palate of any long-term visitor, access to a broad range of spices and cuisines is invaluable. Mumbai--Formerly in downtown, this Indian restaurant made many followers very happy by re-locating to Palermo Hollywood. The spices are rich and complex, varying heat options live up to their billing and the basmati is the real thing. Before wine, try a cocktail made by the skillful manager who knows her mixed drinks. A gin and tonic made with real quinine powder is a revelation: one begins to understand how the British fared so well in the colonies. Palermo Hollywood: Honduras 5684. 4775-9791. The menu in this Indian restaurant where mostly English is spoken lists the following options for spicy heat: mild, hot and Indian hot. With Indian hot, they also serve a hot sauce on the side, to which I would apply the designation "lethal". (But perhaps I'm out of training.) The chapati here is more interesting than the nan, the lamb is excellent and even aloo gobi--the most basic vegetarian dish--is subtly spiced. Since the portions are on the small side, you'll need to order at least three dishes resulting in a fairly high tab by local standards. Near University of Palermo, the place is comfortable enough to attract not only homesick programmers but also couples on dates, so it's worth paying up a little. Palermo Viejo/Abasto: Corrientes and Bulnes. Offering garaged valet parking, the very large Palermo Soho outpost of a popular Mexican restaurant chain hosts a crush of clients from the northern suburbs on Friday and Saturday nights. Otherwise, reservations are optional. The ambitious menu goes well beyond Tex-Mex to include classic soups and other traditional selections from real Mexican cuisine. The location is convenient to small hotels such as Bobo and Esplendour. 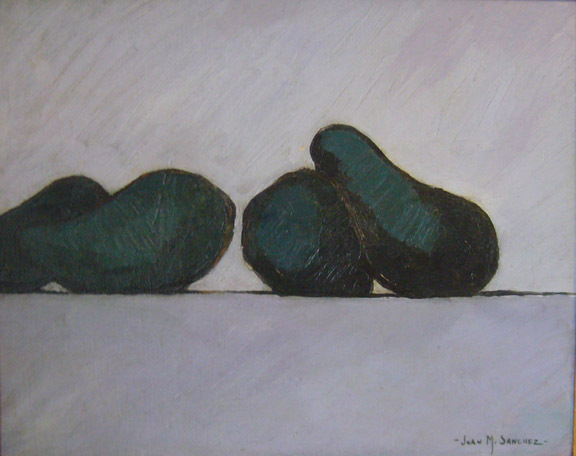 Palermo Soho: Juan Justo and Guatemala. 4775 0380. Unless you arrive really, really early, be prepared for a wait at this slightly cramped, yet pleasantly staffed Mexican restaurant with so-so food in Soho. It draws a student-age crowd. Palermo Soho: El Salvador 4999. 4832 8054. With its 50's retro furnishings and cocktail bar, Green Bamboo is a hot little spot for assuaging those nagging Indochine cravings. As the evening wears on, the soundtrack and ambiance morph into club mode. Palermo Hollywood: Costa Rica 5802. 4775-7050. Unlikely as it may seem, this specialty North African restaurant on the park in Soho is a favorite spot for the prosperous 30-something dating crowd. Dining options include rooftop, tables or floor. The merguez couldn't be better, but order several different dishes or you'll go home hungry. Palermo Soho: Armenia 1880. 4833-5662. With an Armenian church, school, recreational and cultural centers plus a mid-eastern (never say Turkish) restaurant, the 1300 block on Armenia in Palermo Soho is the power vortex of the Armenian community in Buenos Aires. Interestingly, the basement of the cultural center is also home to La Viruta--a milonga where you can tango your heels off Wednesday through Sunday from midnight until 6am. When your body cries out for healthy Mediterranean vegetables such as berenjena (eggplant) & tomatoes, yoghurt & cucumber or Persian rice topped with shredded chicken, this Armenian restaurant is the answer. Palermo Soho: Armenia 1382. 4773-5081. This restaurant, a parrilla with asador (an iron tripod on which certain cuts are roasted, bears testimony to the agricultural wealth of Argentina's wet pampas. For a change from steak try vacío or tira de asado, cuts that are harder to eat but whose pungent flavors are worth the effort. With a chorizo appetizer, Criollo salad and a bottle of Alamos reserve malbec, this is the quintessential Argentine meal. Palermo Soho: Serrano between Cabrera and Gorriti. A Buenos Aires institution, this classic German-style cerveceria serves a great little steak or sausage and sauerkraut in a pleasant, bright environment. The narrow wooden booths with their flip-up seats make the place feel as though it belongs in a 20's movie. Botanico: Santa Fe and Armenia. Claiming a French heritage, the spacious restaurant pleases for a relaxed lunch break from Soho shopping. Palermo Soho: El Salvador 4618. 4831 7176. Here at BIDDINGTON'S, our work is also our play. When we're not exhibiting and discussing art online, we're learning about wonderful objects in shops, at great shows and in museums all over the world. In this article, Jake Biddington offers dining tourist information this fascinating and fashionable destination. COPYRIGHT: Images and information within www.biddingtons.com are Copyright Biddington's, Inc.--except where preceded by individual copyrights of the artists. Downloading or printing for online or print reproduction of any materials without specific written permission from Biddington's, Inc. is prohibited.